A lot of modern Linux distributions created with desktop users in mind go out of their way to be user friendly. Ubuntu, Mint, openSUSE, Fedora — and many more. It is a sign of how desktop Linux has matured that even non-techy types can get a fully featured and easy-to-use open source operating system up and running in not much time at all. The creators of CrunchBang Linux, however, haven't quite gone in the same direction. That's not to say it's particularly unfriendly to install and use. CrunchBang's installation took only around seven and a half minutes on our Lenovo S10 netbook, and the questions the graphical installer asked were for the most part straightforward. The only real exception to this was partitioning the hard drives. It was a doddle, but for a novice it may be a little intimidating — "back in the day", of course, this was par for the course (in the good old days when Lilo was a bootloader not some burned-out, B-grade celebrity). 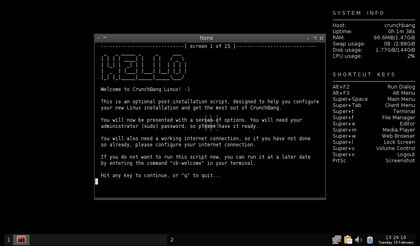 The CrunchBang Linux post-install script. The post-install script also gives you the option to install OpenOffice.org. Many distros install the open source office suite by default, but CrunchBang offers Abiword (for word processing) and Gnumeric (a spreadsheet program) — and I'm a long-time fan of both programs. Other default packages include Gedit (text editor), the Thunar file manager, Chromium, Gimp and the VLC media player. Booting up the system took about 35 to 40 seconds from power-on to the log-in prompt, and about 17 seconds to log in; these times are not quite as good as our results when we tested Peppermint Ice Linux on the same netbook. There's no special Start-button style menu; instead you get two virtual desktops (with, thanks to Conky, a readout of current memory usage, CPU utilisation, etc., as well as a handy guide to keyboard shortcuts). Crunchbang uses the lightweight OpenBox window manager, with tint2 providing a taskbar that lets you switch between virtual desktops and applications. If you want a not-too-resource-intensive Linux distro for a netbook or running on an older PC, CrunchBang is definitely worth a look. It's probably better for people that like to tinker with their operating system's look and feel and get things Just Right, rather than someone looking for an out-of-the-box desktop system bedecked with widgets and fancy graphics from the get-go. You should also take note of the website's disclaimer: "CrunchBang Linux is not recommended for anyone needing a stable system or anyone who is not comfortable running into occasional, even frequent breakage. 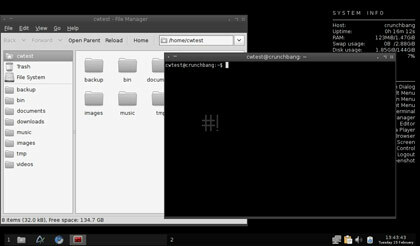 CrunchBang Linux could possibly make your computer go CRUNCH! BANG!"